Total cost to ride is $80.00 which includes One Event Licence, Club Membership, Transponder. 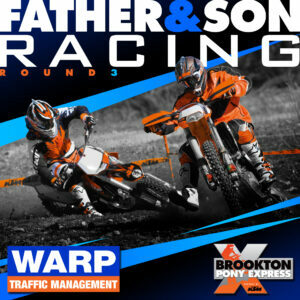 WARP Traffic Management has come on board to sponsor this class and enable the discounts Thank you!! Obviously, there will be speed/skill deficits and advantages across the class so we offer the solution of BUYING TIME!! For $5.00 you can buy a minute off each lap BUT should you podium from your ample bank account 😉 you will pay $10.00 per lap. All funds raised through this roughshod money grab will be donated to a local Brookton fundraiser. You will not be eligible to bribe the timing officials should any rider in your team be graded Expert or in a past life have been graded Expert or A or B Graded Motocrosser.